The Tracer EX2 wheelchair sets the new standard in manual wheelchairs. The Tracer EX2 combines the design and technology of the 9000 series and incorporates it into the Tracer series. A true dual-axle position allows for repositioning the 24" rear wheels and 8" casters for adult and hemi seat-to-floor heights. Hemi spaced footrest and a full range of accessories. The new design also makes it possible to interchange components with the 9000 series chairs. Meets RESNA standards for manual wheelchairs in product performance 14-gauge crossbraces add strength and durability Dual-axle positions allow variation of seat- to-floor heights Durable, low-maintenance, triple chrome-plated, carbon steel frame is long-lasting Urethane rear tires, mounted on "no flex" wheels, offer superior performance Seat Width: 20" Seat Depth: 16" standard Seat To Floor Height: 17.5", 19.5" Back Height: 16" fixed Product Weight: 36 lb. (TREX2/WD86/28) Product Weight Capacity: 250 lb. Warranty: 5 years on frame and crossbraces. Does not include hand brake extension and cushion. 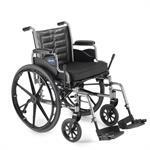 Invacare Wheelchair 18" Wide. A Best Seller! !